Product #16176 | SKU BRCH900 | 0.0 (no ratings yet) Thanks for your rating! Remote operation is a major component of the BRC-H900's design. The included Sony Remote Commander utilizes IR to control the unit, which also has a built-in 3-position IR selector switch, allowing individual control of adjacent units. Additionally the optional Sony RM-BR300 remote control unit can control the BRC-H900 when connected to the unit's built-in RS-232C or RS-422 ports using Sony's VISCA protocol. The RM-BR300 can individually control up to 7 cameras daisy chained together. Installation of an optional IP controller card in the expansion slot allows for remote operation over IP. The small size and remote operation capabilities of the BRC-H900 allow for placement where a manually operated camera and operator could not go. It features remote control operation of pan, tilt, zoom, focus, iris, shutter speed, and gain. 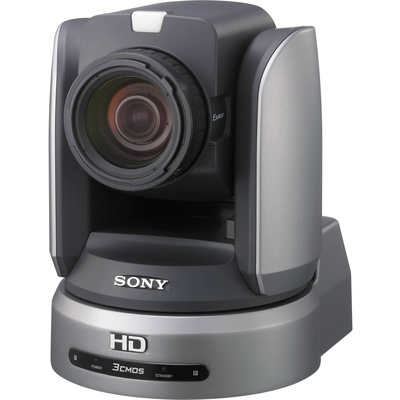 The BRC-H900 is suitable for use in the corporate boardroom, video studio, auditorium, house of worship, government buildings, and for remote and e-learning applications.